As Easter approaches I remember the Easter I spent in Afghanistan away from my blood family, but with my brothers and sisters around me. I spent nine months in Afghanistan on the front lines. The front lines in Afghanistan were never defined in the open sand, so the front lines were where you were positioned at. Within a few months of coming back from Afghanistan I started to find myself withdrawing from everything, even my own family. It’s one of many signs of Post-Traumatic Stress Disorder (PTSD). One of the lowest points in my life occurred years ago when I was home here in Virginia, shortly before Easter time. My parents had a severe accident and I went into to a severe depression, shortly after. Here my Mom was in Intensive Care Unit and I couldn’t do nothing about it. My Aunt stayed at the house after I got into Mom and Dad’s from driving nine hours to get home, my wife at the time wanted nothing to do with me and my family, so I was alone. I didn’t have my brothers and sisters I relied on in Afghanistan, so I turned to the bottle. Like many Soldiers, Sailors, Marines, and Airman tend to do we find the bottle is the best way to hide our feelings. I shortly realized this one the answer, I started to go through counseling for PTSD. Now, that I’m retired from the service my escape is photography, my passion and my new career. You were probably wondering when I was going to get to that point since this is a photography blog. This image here is my second time capturing the cross at Oregon Inlet Life Saving Station in the Outer Banks of NC. 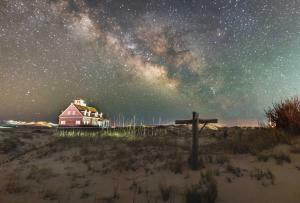 I started my night or early morning out with the plan last year to capture the Milky Way over Oregon Inlet Life Saving Station. Oregon Inlet Life Saving Station history is here below. “This Quonochontaug-type station was the third station at Oregon Inlet. Construction was completed in February 1898 at a cost of $6,860.70. The first station, one of the original outer banks stations, was built in 1874. In 1888, due to the shifting channel, it was replaced by a station 400 feet to the west, which was then destroyed by a storm in 1897. The 1898 station was extensively modified in 1933-34, and further extended in 1979. It was abandoned in 1988 and was ultimately replaced by a new station in July 1990 on Pamlico Sound. The station has received major preservation work in recent years, at an estimated cost of $700,000. The building was raised 10 feet and placed on pilings, allowing the sand to blow freely underneath. The concrete floor was replaced by wood. The roof was replaced and the three-story tower renovated and a new lightning protection system was added as well. The dormitory, which had been added in the 1970s, was demolished. This project was completed in 2008. Uncertainty about the replacement for the nearby Bonner Bridge has stalled the restoration project for some time. The state Department of Transportation is concerned about effects the new bridge could have on the station. If the proposed 17.5-mile bridge were built, the station would likely have to be relocated. Once the state decides on the bridge design, then the station may become more interesting to other state agencies, or even to federal or county entities, and the state wants to lease or give the facility to another agency at some point. All offers to take over stewardship or ownership will be reviewed. The ultimate fate of the station remains uncertain. The building has been a persistent vandal magnet. Old cisterns at the site have been disassembled and carted off. Intruders broke a hole through the porch and it has been repaired several times. There is nothing inside the building, vandals having stripped it to the bare studs, including removal of all wiring and plumbing. Despite the leaking and the deterioration over the years, the building is in remarkably good condition. It is sealed tight now, just awaiting a steward to take over ownership. In the meantime, North Carolina Aquariums continues to manage the property for the state. So, my story about The Oregon Life Saving Station is very short, but very interesting. As I walked up to the Oregon Inlet Life-Saving Station this early morning I was shining my flash light around to see what was out there. The cross here was one of the first things I seen. Shortly, after seeing the cross with my flashlight the hair on my arms stood up. I just knew I had to capture this amazing image to bring it to you. This year I went out there with my first group of students during my first workshop of capturing the Milky Way. It’s an amazing sight to see as you are under the stars. So in short the world is “A Good Friday world”. It is a world full of suffering, questioning, unfairness, trouble, mistakes, hurts, losses and grief. Good Friday in the Christian faith is the day Christians commemorate Christ’s suffering and death on the cross. So that certainly made sense to me at that difficult time in my life.